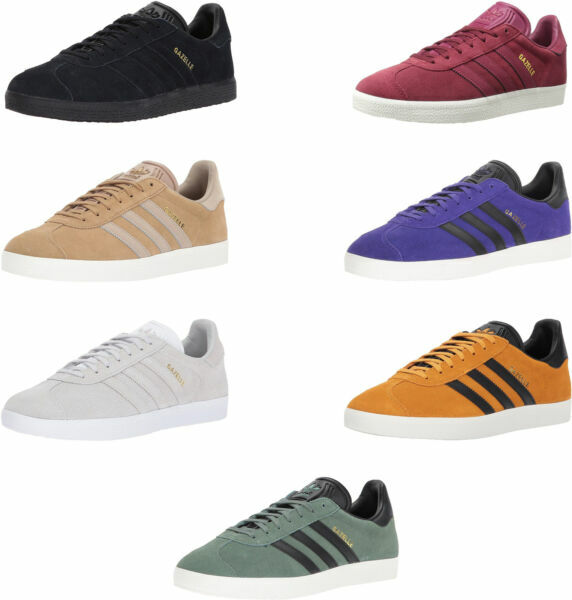 eBay New Factory-Direct Items Free Expedited Shipping 30-Day Returns adidas Originals Men's Gazelle Sneaker, 7 Colors Product Description A premium take on the gazelle, these shoes come with a full premium leather upper that has a super-shiny finish. A gum rubber outsole adds to the vintage look. Rubber sole Shaft measures approximately low-top from arch Premium shiny leather upper is soft and durable Gold-foil Gazelle logo on quarter panel Trefoil logo on heel patch Soft synthetic leather lining Product Specifications http://www.adidas.com/us/help-section-size_charts.html From the Manufacturer Shipping All items are shipped via Expedited delivery methods, free of charge. Estimated delivery time to the contiguous states is no longer than 4 business days for most items. Please Note: Items can only be shipped to the address provided in checkout. Please do not message us with a revised address after you have placed your order. Returns All items are eligible for a no-questions-asked refund within 30 days following delivery. If you are unhappy with your purchase, let us know so we can make it right. Please Note:Customers may be charged a restocking fee.